It was my pleasure to attend the recent Amy Tangerine workshop in Honolulu. It was taught by Amy Tan and assisted by her cousin and mother. Apparently it was difficult to get a space in the class which filled up in two hours after being announced. Besides learning some of Amy's background and style tricks, we were given an ample supply of Amy Tangerine products, well worth the class fee. The ladies who attended the class were ardent crafters and very serious about learning from a professional designer. Amy presented her sample and some of the students were determined to replicating it, even taking photos of the entire album. Others like me, just played with the supplies, loosely following Amy's directions. The first photo is my version of the album cover. I'm sure that mine does not look like anyone else's except for the corrugated aqua cover (love that color and texture) and tag/button closure ( a really cute touch). There were so many embellishment choices from the goodies Amy gave us that I got overzealous...heeheehee and MAY have over done it! 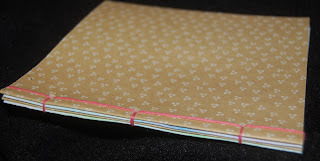 This second photo shows the binding that I did on the pages. We were supposed to bind the outside of album but I preferred to do the pages like traditional book signatures that are glued into the cover. 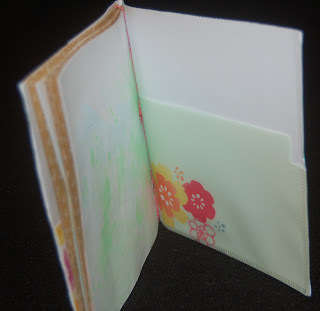 I used the Japanese method of binding (very simple instructions can be found in many sources). Also Amy suggested that we set the pages into each other so that they would alternate between printed kraft cardstock and watercolor pages but I wanted some of the watercolor pages to line up like a double page scenery so I set the folded pages on top each other. To hide the messy sewing of the button on the cover, I taped on a pocket which will be used to hold some supplies (for journaling on the go) or memorbilia from a trip. 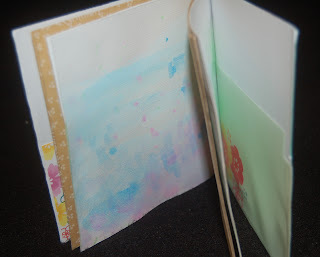 We were given some thick white paper (maybe watercolor sheets) to decorate with watercolors. I chose to paint both sides of the 6x12 pages in sort of an Eric Carle style. (I believe he was the artist/author of some of my children's favorite books.) 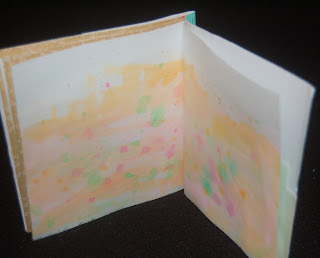 I will probably journal on the watercolored pages and perhaps draw a bit on the double page scenes. Amy gave us some plastic pages to adhere to the back of the album. She suggested to use them for photos. I really like how they coordinate with all her other products. The Amy Tangerine line is fabulous and all of the items work well together. Even the pens are just the right color for journaling. I can't wait to make another mini album with the wood veneer piece that is decorated with a camera. . 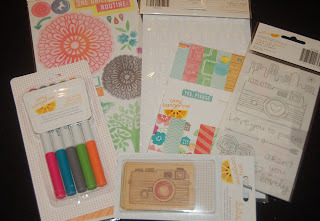 I hope that you will check out the colorful and exciting Amy Tangerine products available now at Ben Franklin Crafts. I know that they will inspire you to create something unique. As you can see, I am still fooling around with the (Hero Arts) mason jar stamped on acetate. There were three things that led to the creation of this card: 1) I wanted to use up the strips of printed cardstock in my scrap pile that were trimmed off other projects. 2) A set of Hero Arts clear word stamps (red tagged at Ben Franklin Crafts) were begging to be inked up. 3) The fun that I always have playing with and smelling card strips at perfume counters. The 6x6 card started on a base of embossed cardstock from the 12x12 Basic Gray pack (available at BFC). Words were stamped on scrap strips and sized to fit the jar. 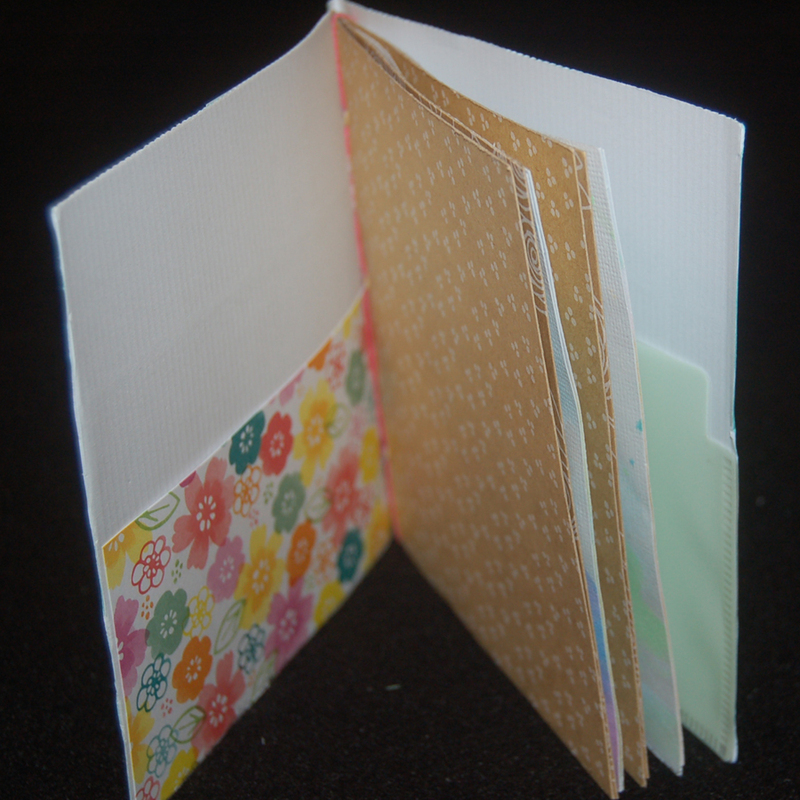 Rectangles of printed aqua cardstock from a 6x6 printed paper pack were adhered with Merikan double stick tape. Then the cut out acetate jar was glued down with 3 in 1 Beacon glue, leaving the top open. One of the sayings was stamped on a rectangle of printed floral paper and it was taped in place. Punched out paper buttons (Martha Stewart punch) were inserted into the jar as well as the paper word strips. Finally, a rose trimmed ribbon was attached as a finishing touch. I also sprayed some floral perfume on the strips and the paper rose. This card is great to send to a crafter because she can remove the word strips and paper buttons to use on her own cards or crafts......a little hidden bonus. I hope your stop at this blog was enjoyable and the post provided you with some new ideas. Please return again and leave a comment if you have the time. I love hearing from you; your sweet comments make me giddy. Last week I had the opportunity to attend workshops for employees of Ben Franklin Crafts. It was an all day event full of learning and plentiful craft supplies. In the photos below you can see two of the projects I made during the event. 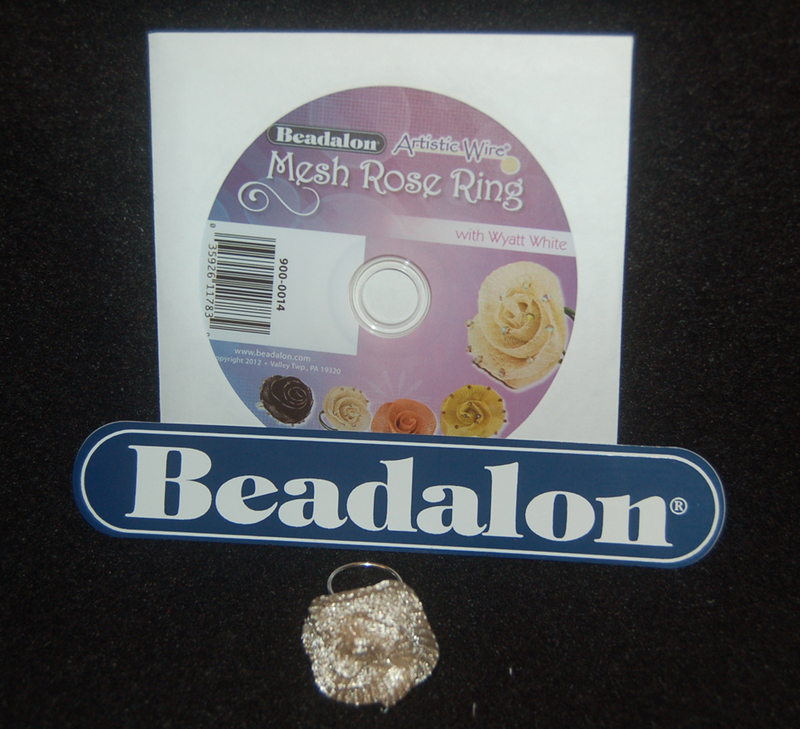 The first one is a Beadalon mesh rose ring. It was a unique way to use the metal jewelry mesh ribbon sold at Ben Franklin Crafts. 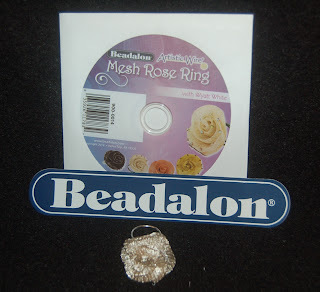 I believe that you can access the instructions for the ring on the Beadalon website or the disk shown can be purchased at BFC. 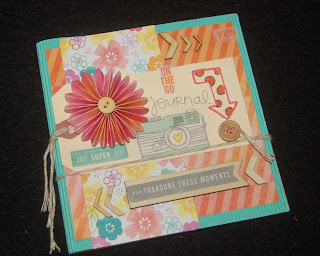 If you cannot find a source for the instructions perhaps Joy (Joy of Crafting) will be able to help you find them. 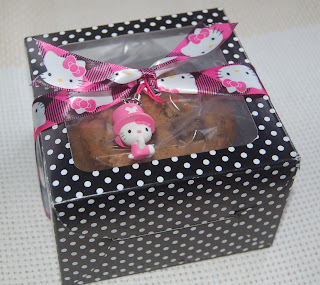 Another fun project was taught to us by EK Success. I didn't think I needed any more punches but when I saw the adorable mini scallop circles; I knew I had to buy some. The selling points for the punches were the convenient space-saving shape and clearly labeled size on the top AND side of each punch. 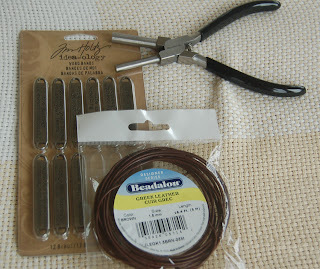 From Ben Franklin Crafts I purchased only four sizes of scallop circle punches but I intend to eventually get all the sizes and the scallop square ones as well. The assorted scallop circles were punched out from floral print paper and stacked together with foam dots . They were strung on twine through two holes punched in each bottom circle. Shiny sticker buttons were attached to the top of some of the smaller circles. 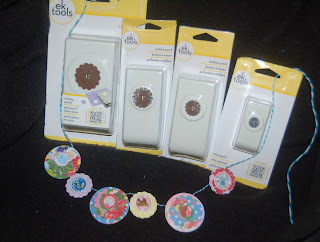 This was a very simple project which has many possibilities as embellishments for cards or gift wrapping decorations. In posts to come I hope to show you more of the pretty crafts we created in the workshops. I think they will inspire you to try new products and understand the creative possibilities of simple tools. Experimenting with new ways to add healthy ingredients to yummy desserts is a pastime of mine. Today I replaced the flour in the recipe with whole wheat graham flour and rice flour. 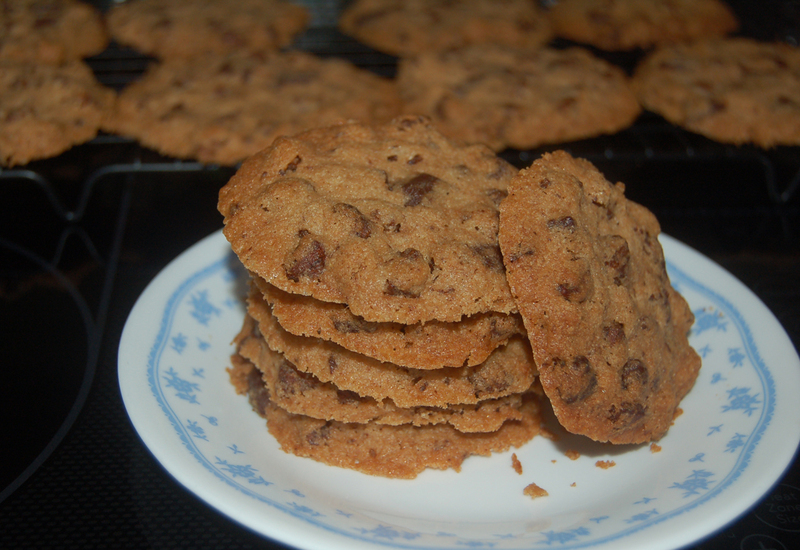 Also to bring down the sugar content, Splenda Blend brown sugar was used. The result was a tasty somewhat healthy delicate cookie with the sweetness of dark chocolate and the saltiness of arare. Mix the softened butter and sugar together. Add the vanilla. Blend in the flours. Then add the chocolate and arare. Use a scoop and place a ball of dough on a parchment lined cookie sheet. Flatten the balls of dough and bake them at 350 degrees for 10-12 minutes. Cool the cookies on a rack and then pack them in an air tight container. At first when I saw the Authentique Carefree Collection of papers and stickers at Ben Franklin Crafts, I was not excited because I love colorful stuff. However, upon closer inspection I realized that the muted reds and grays would be perfect for a vintage card.....perhaps a Mother's Day card. 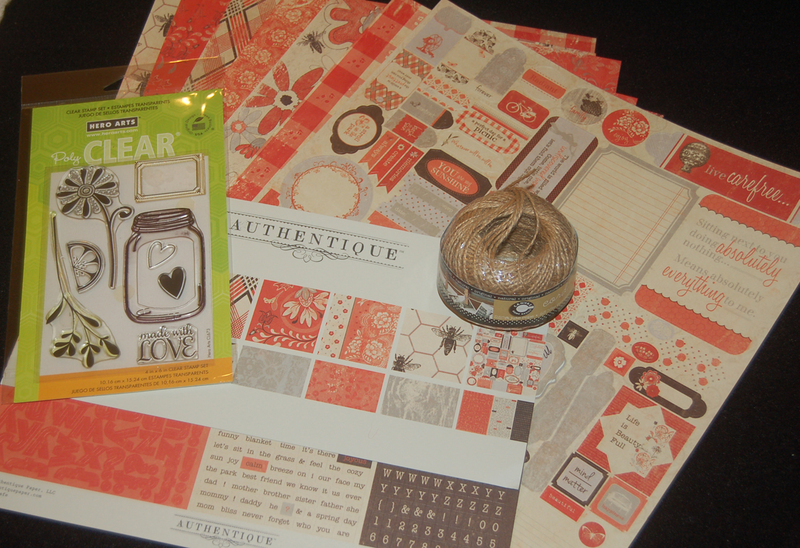 My mother loved flowers and even now I could easily fill jars with words that remind me of her, so the Hero Arts clear stamp set, Love Jar, seemed the perfect pairing with the Authentique items. 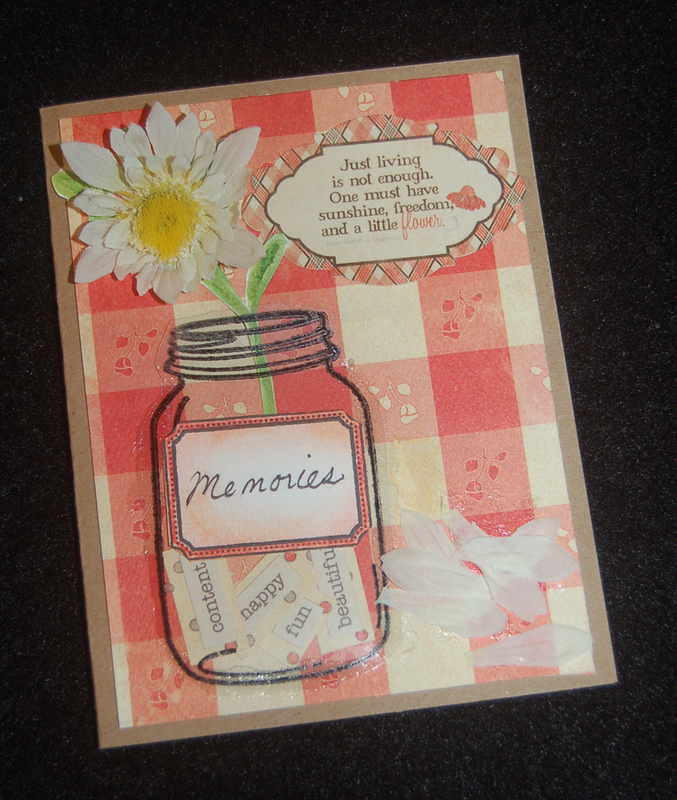 The card began with the stamping of the jar image on clear acetate with Staz On black ink. After cutting out the image, I applied Beacon 3 in 1 or FabriTac glue to the edges of the jar but not the top and adhered the 'jar' to the checker patterned cardstock. 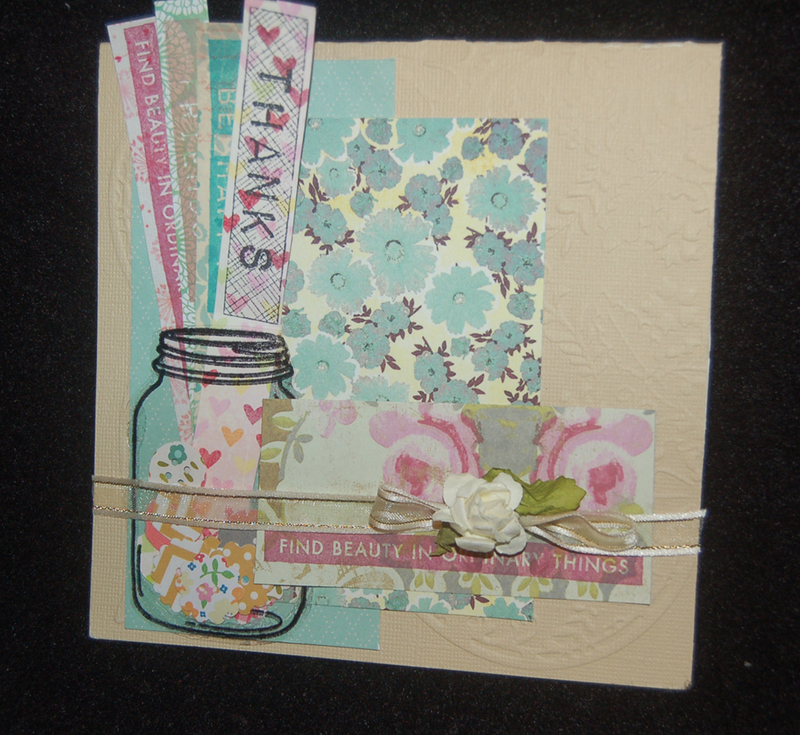 Word stickers from the set were applied to scrap cardstock and inserted into the jar. 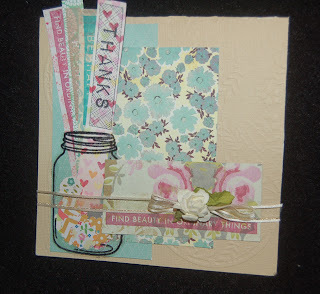 The stamped stem and leaves were cut out and inserted into the jar too. An artificial blossom was glued on the card and the saying sticker from the set was pressed in place. As a final touch, leftover artificial flower petals were glued to the card. 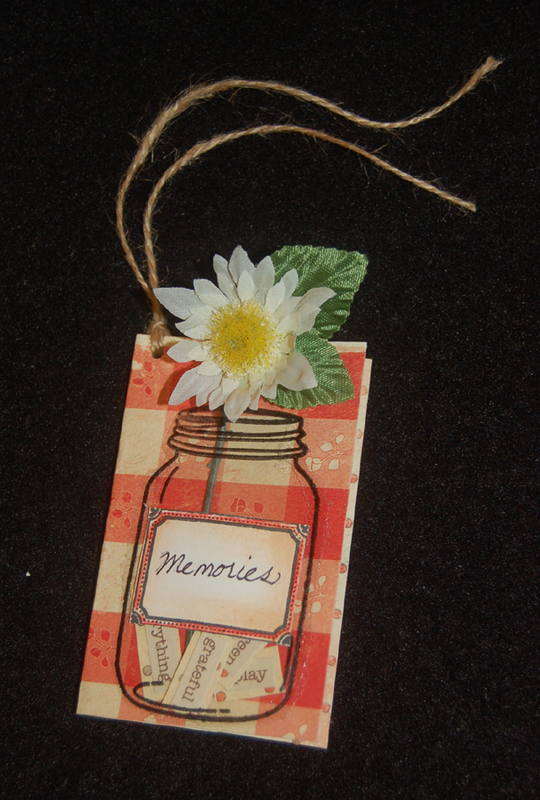 Since I had an extra stamped jar image and word stickers, I decided to make a tag with the leftover cardstock. Because I was too lazy to fussy-cut the stem and leaves, I used an artificial stem with leaves. All of the items used on this card can be purchased from Ben Franklin Crafts, even the twine and artificial flowers. 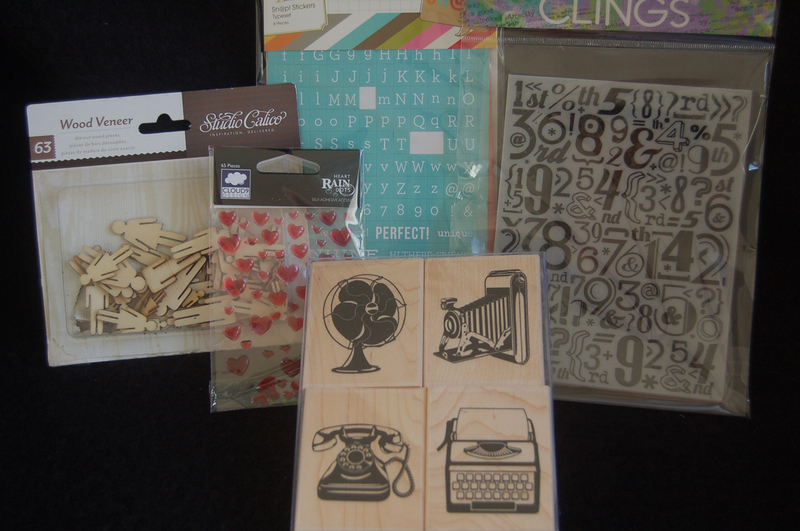 There are always new items arriving at the store so go check them out and don't forget to use your craft club card for a discount (even on sale items!). Thanks for visiting this blog site. I hope you enjoyed your time here and will return often. 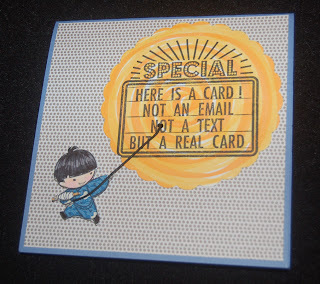 When I first spied the 'Special' Hero Arts rubber stamp at Ben Franklin Crafts, I didn't hesitate to purchase it. I had planned to use it to stamp the back of my cards sent to those who regard handmade cards with the same importance as text messages. 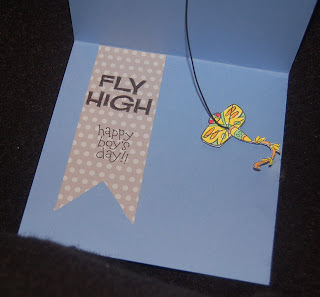 I also purchased (at BFC) the new Sister Stamp of the little boy flying an Asian kite. This stamp was intended for my annual Boy's Day cards. Rather than making the usual Asian theme card, I thought I would surprise the recipients with a simple unfussy card. Putting the 'special card' message on the front in a sun-like target was my way of emphasizing the message LOL! 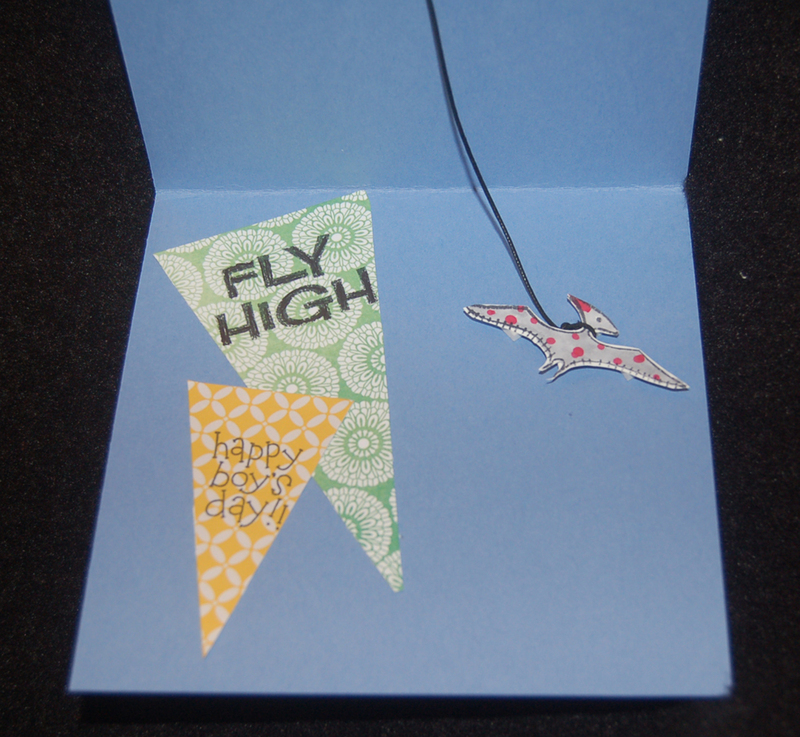 On the inside of the first card I used the kite image that was part of the SS rubber stamp. 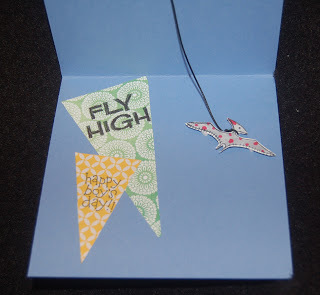 The kite string is a cord that I strung through a hole punched through the card front (with a long reach Crop-o-dile punch). 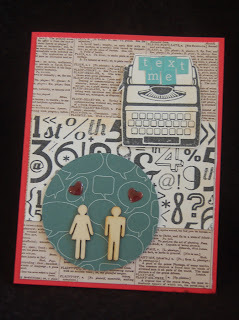 I will never stop creating cards as long as I can use a rubber stamp, see images and colors, and cut with a scissors. I have a mission to persuade the world that we still need the human touch to send messages from the human mind and heart. Don't become a machine okay? 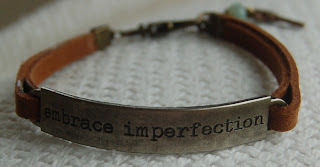 When I first saw the Tim Holtz word bands, I was immediately drawn to the meaningful sayings. I wondered what to do with the metal bands and purchased them even though I didn't have a clue what I would craft. 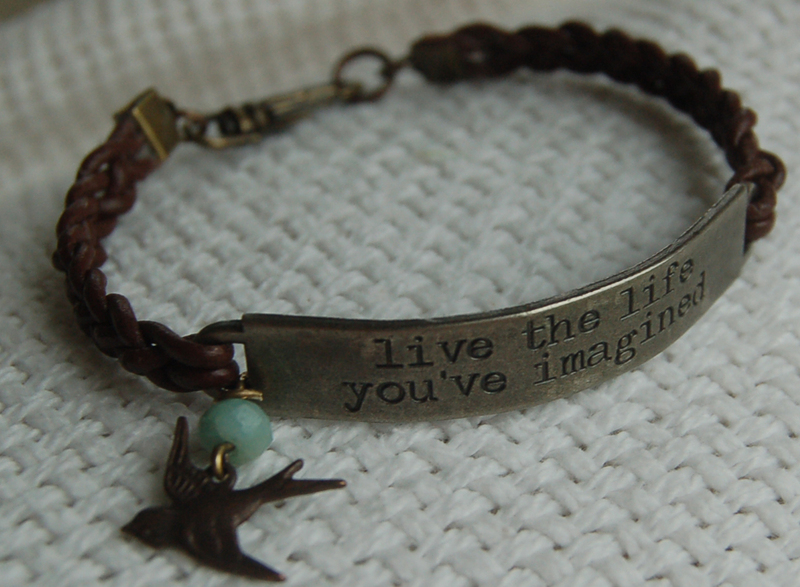 Once at home I decided that I would really love some jewelry that included the thoughtful words. Using my Beadsmith pliers (see bottom photo), I gradually shaped the metal band into a curved shape. It is a really sturdy band so it does take a bit of muscle and time to get the gentle curve. 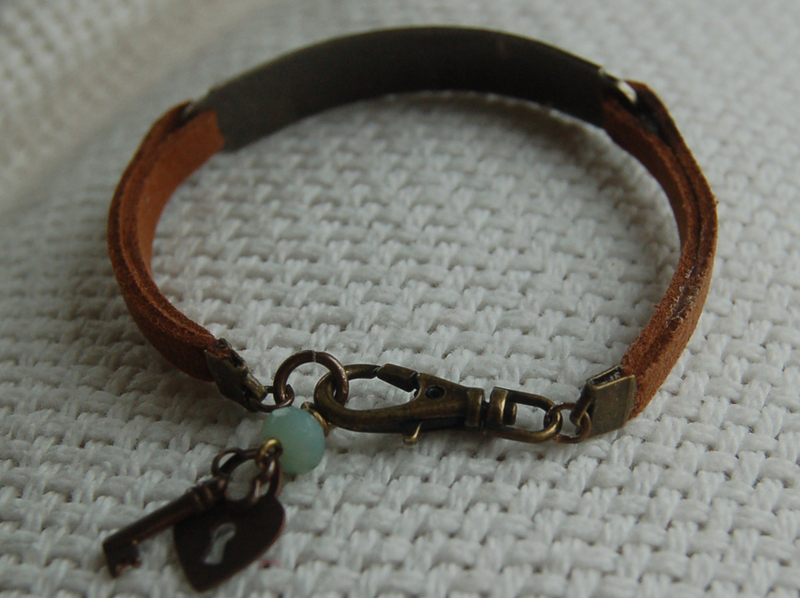 Actually the first bracelet I made with the TH product was the bracelet with the plain suede strap. After slipping the strap into the side openings of the metal band, it was easy work to at a bit of glue and squish the metal ends in place. A swivel lobster clasp was added and the bracelet was done. To add a little feminine charm, I added some Vintaj charms and semi-precious beads. The second version of the bracelet (the first photo) was made using Beadalon Greek cord. A simple four-strand braid makes the straps fancier. Sometimes if you really love a certain craft product but don't know what to make with it, you should just buy it anyway. It's amazing how your brain will think about it for awhile (sometimes months or years) and suddenly come up with a perfect solution. Well, imagine that! You DO have a creative imagination! Today while sending out yet another text, I contemplated how much communication has changed since I was young. 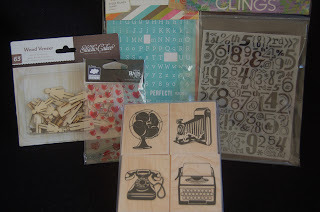 When I got to my craft room, I started looking at my vintage-look stamps and retro papers. This card was the result of my infusion or maybe confusion of past and present. It didn't resolve any of my questions about which is better (speed vs poetry) in life, but creating this card did somehow make me feel happy to have an expression for my queries. Have a lovely day and don't be afraid to take time to contemplate your life's experiences.